Actually, I intentionally do not own an alarm clock. When creating my "what does my ideal life look like" map, waking up naturally was high on the list. As always, I enjoy your blog and am convinced that you are the Queen of Online Research! Claire, I much prefer to wake without an alarm clock, too - but sometimes my schedule just doesn't allow for that. Waking naturally wasn't as high on my "ideal life" list as it was on yours, it seems, or I wouldn't schedule like that. I have had the progressive clock (#4) for a couple of years and I love it. It progressively lights up the room and uses other gentle sounds, like birds chirping, etc. to wake you up, then at the actual time, an alarm rings, just in case you slept through everything else. I usually wake up before the alarm sounds. It's much less "shocking" than any other alarm I've ever used. I think I would like #4 too, progressive. I have a buzzer alarm but rarely get to the buzzer as the live animal, I mean fur-baby wakes us every morning. Here's one more comment from Danette Lewis, the person I quoted earlier who has the progressive clock: "I don't use the aroma therapy part of the clock. It's just too much trouble to fill up on a regular basis and the smell wasn't strong enough to wake me anyway." Oops, make that Dannette Lewis, with two n's. 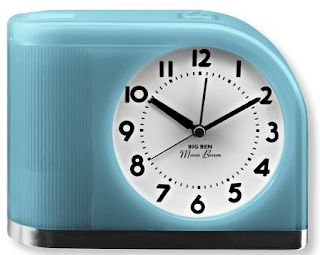 The Voco clock goes on my short list of unnecessary things I will allow myself to purchase whenever I can come up with an appropriate excuse to purchase them. In this case, perhaps my current alarm clock may have an unfortunate "accident" . . . .
Cynthia, I've read some Wodehouse but have never seen the show. But I see the show is out on DVD, so I can rent it sometime and play it on my Mac. If you get the clock, please let me know if it's as wonderful as it seems! I got my son a battery operated chime alarm clock from Avon. We live in a victorian that has one outlet per room, so plug ins are kept to a minimum. He loves it! 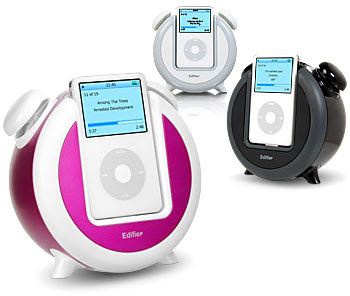 Jerry, the talking alarm clock was hilarious! I laughed out loud when I checked out the website. Hubby's birthday gift is fpund!! Anonymous, I'm so glad there's yet another person who fell for the talking alarm clock. 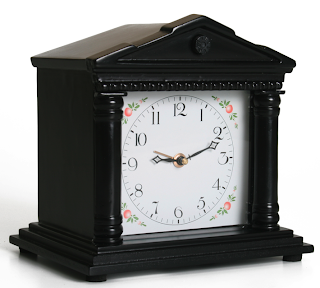 When your hubby's birthday rolls around, please let me know if the clock is as good in person as it seems on the web. David, what a great counterpoint! I just saw that someone wrote a whole list of annoying alarm clocks, if you want to pursue that even more. 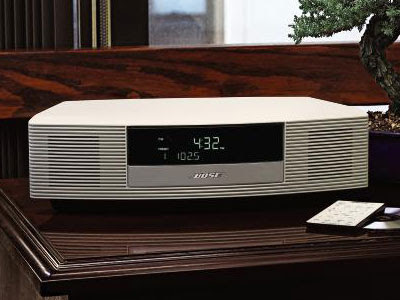 Alarm Clock uses an ambient light, peaceful sound and stimulating aromas from nature to awaken sleepers. Alarm Clock looks like very attractive one. 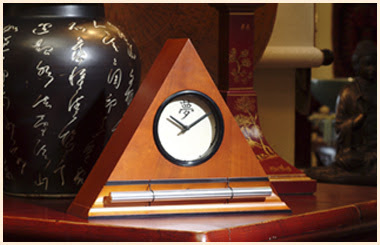 Jerri - I finally bought the Zen alarm clock! My husband and I absolutely love it. We actually leave it in the next room because the chimes are so reverberating. I used to have the progressive alarm clock which I liked too, but the progressive chiming on the Zen clock does a lot better job of actually waking you up! Shatrarrow, I'm so glad to hear you got the Zen alarm clock and that you're enjoying it - thanks for letting me know! haha great post, I could use one too! 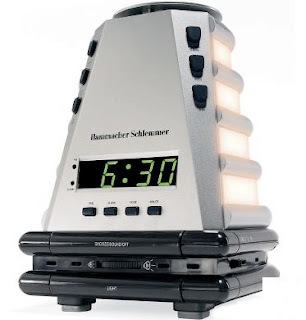 I also have the Progression alarm clock, and it really is the best I've ever had. All alarm clocks before I'd completely ignore, but this one manages to wake me up and not make me feel like I've been dragged, confused, kicking and screaming into some fiery abyss. Half an hour before the set time, the light starts coming on. The light would theoretically start warming the scent pads (or the beads that come with it, which are almost all terrible), and I did use those in the beginning, but it takes too much effort to remember to use a new scent pad every night (and maybe you wake up in the morning and don't want to smell that particular choice). Fifteen minutes before you wake up, the sound starts. The default is chirping birds, but since it's on a loop, it gets old FAST. The Zen Melody, however, is pleasant enough to listen to. If you're still not up (or hit the snooze, which works for something weird like 8 minutes at a time), the real alarm will finally blare hatefully at you. It's given you so many chances to get up at that point that you really can't be too upset though. Should you wish to use them, I know that fragrance oils from Bath and Body Works work very well on the scent pads. Alicia, thanks for the very complete report! There's nothing like hearing from someone who owns and uses the product. 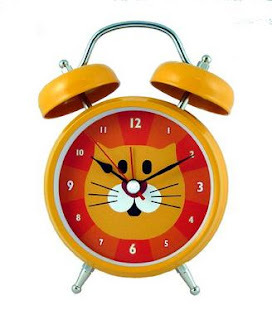 The Moonbeam clock has a great retro look but is absolutely horrid and terrifying to wake up to. The light doesn't progress, it flashes like a neon light. It's like the light torture used on prisoners of war where a light flashes on and off at regularly timed intervals. Scary. Helen, thanks for letting us know!